I seem to have a habit of going fishing, when extreme weather is threatened and so it was again this week, as Hurricane Helene swept across the Atlantic toward our shores. At this time of year I put a visit to the River Blackwater into my diary. The Blackwater runs south to north and being withing 10 miles of my home at any point, I would fish it more, but generally parking is a problem, my van being too tall to get under the 2 metre barriers restricting access to most public carparks along the river. I had recently been told of a free stretch with no barriers, that ran behind an industrial estate and decided to check it out. With tackle in the van and bread from the freezer, it was worth a look, if not I could fall back on the a club stretch of Blackwater a few miles downstream. Driving into the industrial estate, I could see immediately that parking would be a problem, designated company parking, causing the overflow of cars and vans to park up on kerbs and block entrances. I cruised the parked cars to the end, finding a space among those of a car company. Slotting in the van, I realised that I could not occupy the space for long, but while I was there, I could at least take a look at the river, which lay just through a screen of trees. The banks were overgrown, but the river was clear with little weed and I could see big chub swimming up and down, but with overhanging trees, fishing would be difficult. Ready to drive off, I walked back to the van, only to be met by the site manager, who informed me that I was parked in a designated parking area. I apologised, saying that I just wanted to look at the river, regarding the fishing. At this his mood changed, telling me how good it was for fishing and being an angler himself, he would show me his favourite swims. We walked up to a weir, where we could see a shoal of about a dozen bream of about 2 lb each, just sitting in the flow of the back eddy. Again it was overhung with trees, various floats tangled among the branches, evidence of attempted float fishing, it would be feeder fishing, or nothing here. We walked back to the carpark and he said “Why not have a dabble? If anybody complains about your van, say that Tony said that it was OK to park”. Never one to look a gift horse in the mouth, I accepted his offer, loaded up my trolley and headed back to the weir. Just upstream of the trees, close to the outfall, was a short strip of overgrown bank, that would allow me to cast a float, spending the next twenty minutes hacking away at the stinging nettles and dead giant hog weed, with a bank stick. There was just enough room for the tackle box, so set up my 14 foot Browning with a 6BB bodied stick float and was ready to fish. I threw out a couple of balls of liquidised bread to my side of the flow, ready to use a 6mm bread punch on a size 14 barbless hook. First cast in the float sailed away and a hard fighting roach swung to hand. The swim was no more than two feet deep, and I bulked the shot round the base of the float, with two No 4 shot six inches apart up from the hook. This rig worked well with no tangling, the heavy float allowing me to hold back despite the ever increasing wind. Every put in was followed by a take, the roach often hooking themselves each time I held back hard, although this sometimes meant a bounced fish. I was catching steadily, putting in another ball and watching the shoal of roach rip into it. Who said that perch don’t take bread, this being one of two that I caught. 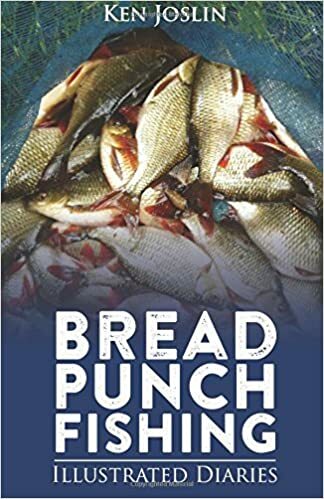 Roach continued to line up for the bread, having found a sweet spot on the crease between the outfall and the eddy, an under hand cast laying the float behind the bait each time, the fish grabbing the bread as it fluttered down to the bottom. All this changed in minutes, as the sound of the water rushing over the weir drowned out the roar of the wind gusting through the trees. 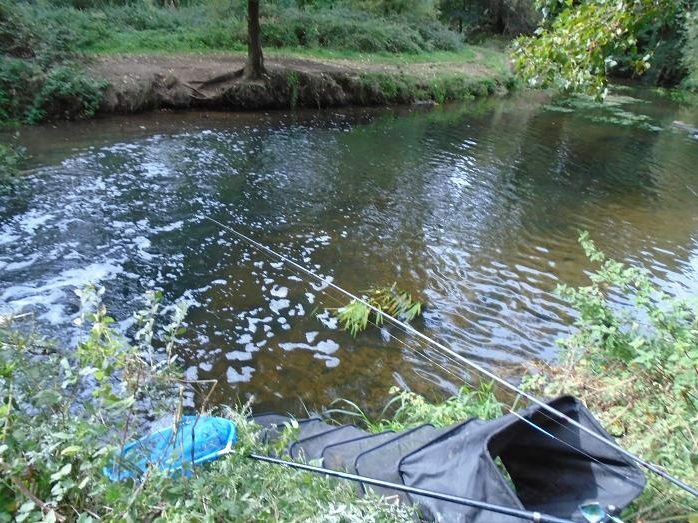 Upstream extra water was being released into the river, forcing the back eddy to reverse its motion and strong enough to drag my keep net round. Where I had been holding the float back against the steady flow, it was now coming back toward me. The roach were still there taking the bread, but I now began to drop lightly hooked fish. 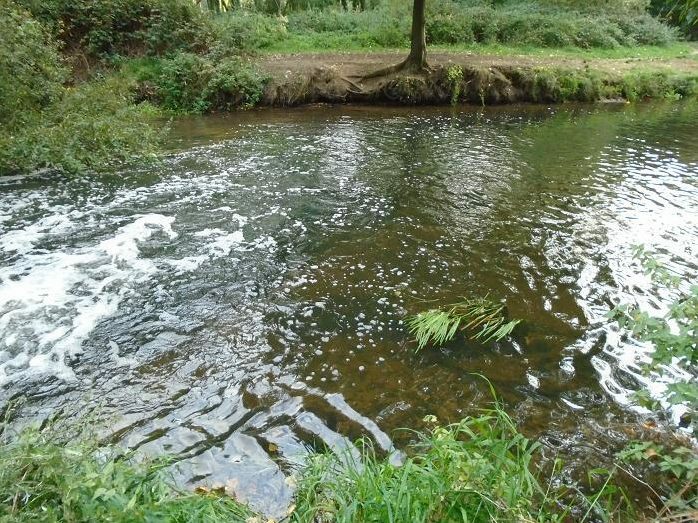 Casting out into the strong flow, the bites had changed, lightning dips and bangs of the float indicating dace, knocking off the bait in seconds. Stopping the float put me in direct contact with the fast biting dace, rattling the rod top and briefly flashing over before throwing the hook. Got one! More by luck than judgement, setting the hook, then releasing the line allowed the dace to run, before lifting into it again. This seemed a better tactic, but their tumbling fight in the more powerful stream, saw more dace throw the hook, than reached the net. 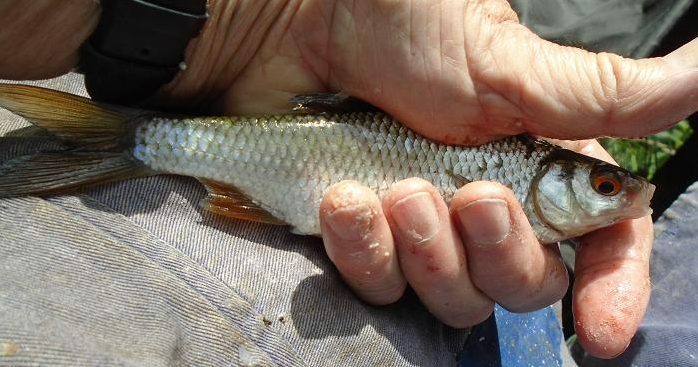 Roach were still among the dace, the more positive bites, meaning fewer lost fish. As quickly as the rush of water had begun, it slowed again and the catching spree continued along the crease, another ball of bread concentrating the roach in a tight area. I was aware of Tony standing to one side watching me swing in fish after fish. When I asked how long he had stood there, he said “Six fish” then looking at his watch “Four minutes”. I had hoped to find one or two of the bream among the roach, but had probably struck too soon on the slower biting slabs. Tony had never seen the bread punch in action and could not believe that it was so effective on “his” river. I said that I would be packing up at 5 pm, having fished for five hours by then and he said that he would come back for the weigh in. The larger roach had now pushed their way to the front and going up to a 7mm punch seemed to increase the number of netters. What a clonker! The big roach just kept coming, despite the wind that was now blowing leaves and twigs into the river and making an underhand cast impossible, a powerful overhead cast the only way to get the float out to the crease. Like a tap being turned on, the weir began to roar again, transforming the the eddy into a whirlpool, the dace sweeping over to my side, some good ones among them. Control of the float became difficult with the wind billowing the line back toward me, while the float was swept away in the flow. It was time to put the rod down, get out the cheese and pickle sandwiches, followed by a cup of tea. There was an area close to my bank, that looked static and I dropped the float in, but this was full of tiny chublets and gudgeon, taking several of each, before giving up to brave the elements again. 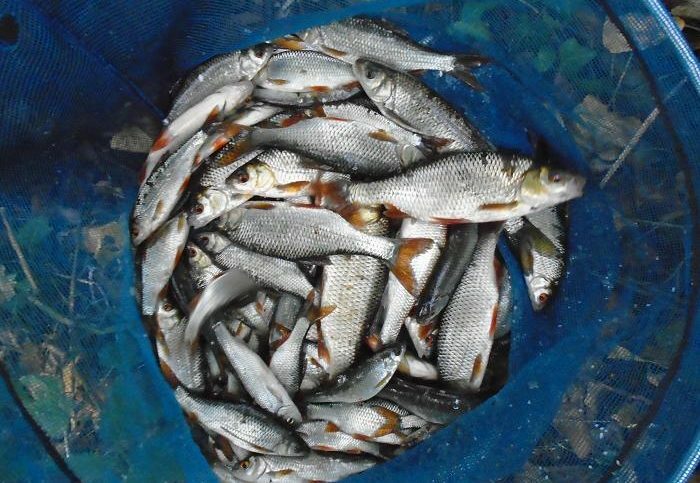 The quality roach were still there and the landing net was coming out for every other fish. The weir shut down again and I put in another ball of liquidised bread, just to keep the roach in place, each cast bringing another. At 5 pm the roach were still feeding, but I could hear the traffic building up on the main road behind me and I had promised to be home by six, so the rod was brought in and I took stock of the session. 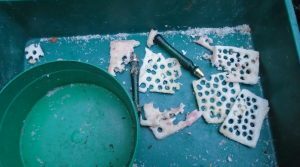 The bait tray told the story of a busy afternoon, having fed a third of a loaf of liquidised bread. As promised, Tony arrived to help me weigh in the net, I guessed it at 12 lb, while he suggested 15 lb. Lifting up the scales was an effort and the 14 lb scales bounced, then settled back to 13 lb 8 oz. I am sure that if I had set up my much softer Hardy 12 footer, I would have landed more fish, but would it have coped with the stormy winds as well? Ah well, who cares? I had had another great session on the bread punch, shame about the car parking.